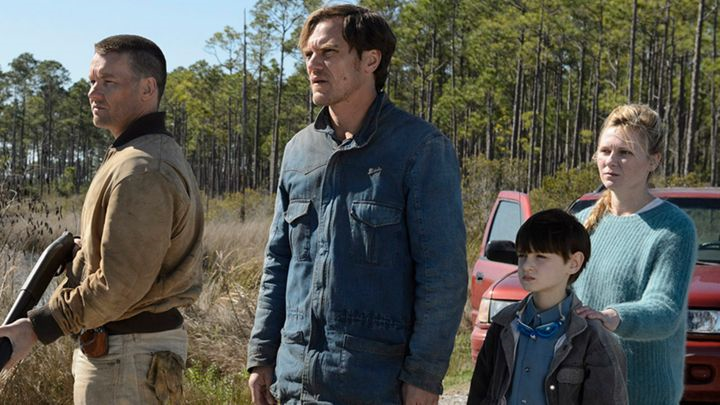 Midnight Special is the kind of sombre, speculative sci-fi film that since the ‘80’s has laid strangely dormant. With a Carpenter-like score and on-the-run narrative, it hearkens back to the days of Starman (1984) and uses the mysterious nature of films of this era to forge a conspiracy-filled journey in the current deceptive environment. With stories such as this, though, where a satisfactory conclusion is hinted throughout, it’s disappointing that the destination is not equal to the journey. Writer/director Jeff Nichols should be applauded for his endeavour and willingness to avoid needless violence and plot contrivances, and in creating drama he succeeds, but with the film frequently eluding to the extremity of what’s at stake it allows itself to be underwhelming upon reveal. Roy (Shannon) and Lucas (Edgerton) are fleeing a religious Ranch with a young boy they have apparently kidnapped. The boy, Alton (Lieberher), has otherworldly powers but is growing weaker as he struggles to contain them and is exposed to traces of sunlight. The three are driving towards the unknown end of a long road, and with the FBI and other Government officials using their far-reaching tactics to stop them, it becomes apparent that Alton is the catalyst for something not previously encountered. One stand-out moment showcases a satellite falling from the sky in fiery fragments; as these pieces slam to the ground their source is not clear, before being explained in a conversation afterwards. Midnight Special encourages consideration, before providing explanatory answers. It could do with asking some more open ended questions. As is to be expected, the cast all commit to the material, and in the case of Shannon and Kirsten Dunst in particular powerfully emit grief at the possibility of losing a loved one but hope that their lot is a worthy one. Jaeden Lieberher is always likeable as the central figure, and Adam Driver is an interesting presence, his character transitioning from clinical observer to willing accomplice, although without ever really proving his worth. Australian actor Joel Edgerton isn’t afforded many significant lines, but through his surprisingly unflappable devotion to helping where he probably doesn’t belong, he’s not hard to like. There is an almost calming quality to this reflective film, and while it can capture the viewer’s imagination, its unfortunately not for any great purpose. The music though, sure and steady, signifies what it also does right. Exactly what I alluded to in my thoughts! The destination isn’t as compelling as the journey, but I was interested for most of it. I wanted to know more, about the kid, about the reveal, etc. I don’t like being spoonfed, but I also think being in the dark with no answers isn’t the way, either. I do believe that there is a happy medium between being spoonfed and still being somewhat ambiguous. Yeah I agree. I liked the mystery here but but I just didn’t feel satisfied in the end. It really is interesting to watch for the performances. It’s a shame. I’ve only just started watching Boardwalk Empire and Michael Shannon’s star is definitely rising, but he might need films with better stories to really make it. I’m not sure his turn as Elvis is going to do it either. Off the topic – if you don’t mind me asking, where do you find pics from films that are fair to use in reviews? Shannon – so amazing in Boardwalk Empire, the whole series is great mate! In regards to your pic question you will often find press pictures on films official websites – sometimes it may be downloading a press kit or using there officially approved pictures. Hope that helps mate.